I wanted my first post on PBS to be a representation of my favorite thing to make, ever. So, pie it is. It definitely wasn’t always this way. Years ago, before I learned how to cook, making a homemade pie was stressful. I made it a few hours before a birthday party and had promised the birthday boy a pie as a gift. Wrong move. Only a few minutes in I realized how over my head I actually was; flour was all over my kitchen, all up in my hair and I quickly learned that the phrase “easy as pie” couldn’t have been more inaccurate. Luckily the baking gods were looking out for me (and the recipe I was using was very good) because I made it out alive and showed up to the birthday barbecue with an edible pie. A week later, I went back in my kitchen to try it again; I was determined to master making a pie! I learned that, like with anything challenging in the kitchen, organization is key. Getting all of the ingredients together before beginning helps with being successful. I also learned that I loved a butter crust over shortening or lard, so this pie crust is all about butter–and the richer and higher-quality the butter, the better. Buttermilk pie is a Southern throwback, though I made some changes to the original. Butter is totally traditional to a buttermilk pie filling, but I eliminated it from this recipe. I found it to be too, well, buttery and I am a believer that there is such a thing as too much butter. 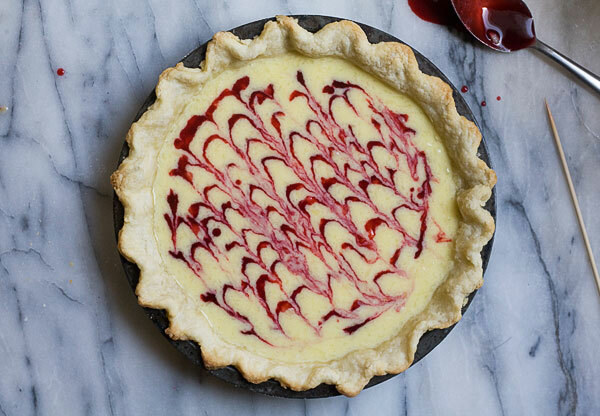 I also added a raspberry swirl which proved to provide a lovely fragrant and fruity element which worked well when paired with the tart, richness of the buttermilk base. My favorite thing about this pie is that it can be made in parts. If you’d like, you can make all of its parts separately. 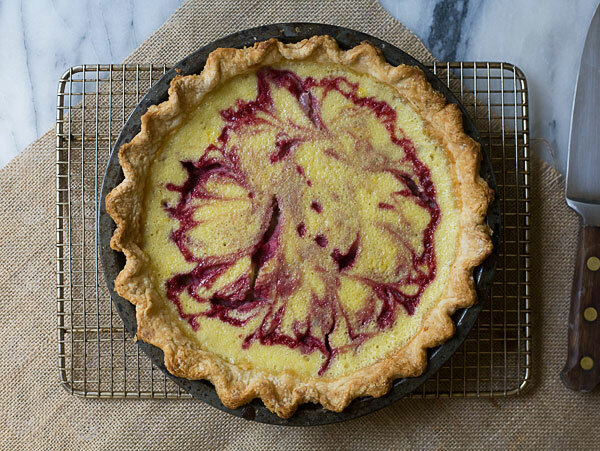 The pie crust, the raspberry swirl and the buttermilk base can all be made the night before and then assembled and baked the next day. When recipes tend to be on the more labor-intensive side, breaking up the process always makes it so much more doable and attractive. 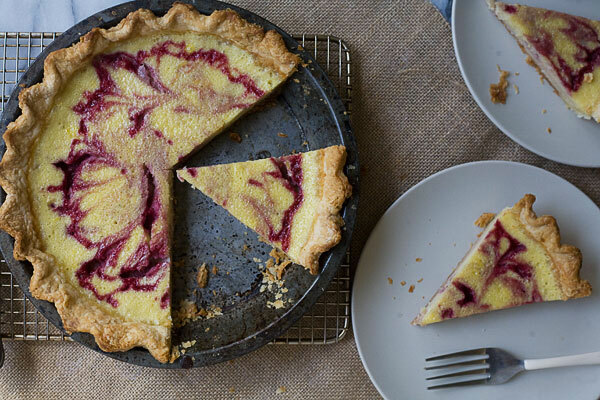 If you decide to make this pie, make sure you bring it to a bbq or summer gathering. This pie will make you friends. Lots of them. Food blogger Adrianna Adarme says you can make all of the parts of this raspberry pie recipe separately and ahead of time on the Fresh Tastes blog. In a large bowl, mix together the flour, sugar and salt. Using a box grater, grate the cold butter atop the flour mixture. Working quickly, and using your hands, break the butter bits into the flour until they're evenly distributed and resemble the size of small peas. Add 1/4 cup of water and mix. The mixture will be shaggy at the point. From here, add 1 tablespoon of water at a time until the dough comes together. I ended up adding about 2 more tablespoons of water, equalling 1/4 cup water, plus 2 tablespoons. Flour your counter and dump the dough onto it. Knead the dough a few times until it comes together; form the dough into one solid disc. Wrap the disc with plastic wrap and transfer it to the refrigerator to chill for 1 hour or overnight. Remove the disc of dough from the refrigerator. Liberally flour your work surface and rolling pin. Begin to roll the dough, being sure to rotate it every so often to avoid sticking, to a 12 to 14-inch round. Wrap the dough around the rolling pin and unroll it over the pie tin. Gently fit the dough into the bottom and up the sides of the pie tin. 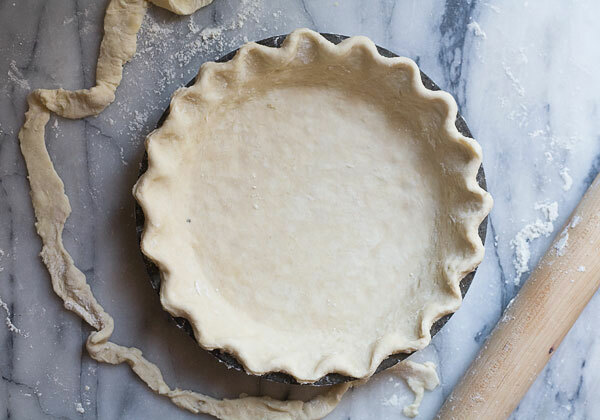 Trim the dough around the pie tin and using your thumb and forefinger, crimp the rim of the crust into a v-shape. Preheat the oven to 400 degrees F. Transfer the pie crust to the refrigerator to chill for 30 minutes. 3. Score the bottom of the pie crust with the tines of a fork. Line the pie crust with foil or parchment paper and fill it with beans, rice, pennies or metal pie weights. Transfer to the oven and bake for 15 minutes. Carefully remove the lining and pie weights and bake for an additional 5 minutes. Remove from the oven and allow to cool on a wire rack until room temperature. Meanwhile, let's make the filling. In a small saucepan, combine the raspberries, sugar and pinch of salt. Cook over medium low heat for 10-15 minutes, intermittently crushing the raspberries with the back of spoon, until the mixture is smooth. Set aside to cool. In a medium bowl, whisk together the sugar, flour and lemon zest. Next, beat in one egg at a time, until the mixture is thick and thoroughly combined. Pour in the buttermilk and whisk until completely combined. Pour the buttermilk mixture into the par-baked pie crust. Using a teaspoon, drop small dollops of the raspberry mixture on top of the buttermilk mixture. Take a skewer and run it through the center of each raspberry mixture dollop, creating a pretty swirl design. Carefully transfer the pie to the preheated oven and bake for 30-40 minutes, until the center of the pie is set. Allow the pie to cool on a wire rack until room temperature, about 1-2 hours. Slice and serve with a dollop of whipped cream or a la mode.